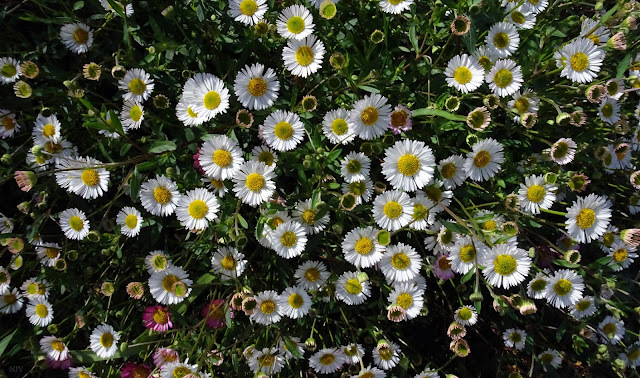 Erigeron karvinskianus is a species of flowering plant in the family Asteraceae known by the common names Mexican fleabane, Latin American fleabane, Santa Barbara daisy, Spanish daisy, Karwinsky’s fleabane, or bony-tip fleabane. Erigeron karvinskianus is native to much of Mexico, Central America, Colombia and Venezuela, and is naturalized in many other places, including parts of Africa and Europe, Australia, Hong Kong, Chile and the west coast of the United States. Erigeron karvinskianus is a vigorous, spreading perennial plant growing from woody rhizomes to a maximum height of 15 cm. Its leaves are located along the stem, the basal leaves dying off as the plant bolts. They are sometimes slightly toothed or lobed near the tips. The inflorescences hold one or more flower heads which are each about 1 cm wide. They have golden yellow disc florets in the center surrounded by a fringe of up to 80 white to pinkish ray florets. Erigeron karvinskianus is also cultivated for its daisy-like blooms, and is often confused with the closely related true daisy Bellis. It is frequently grown in crevices in walls or paving, where it rapidly spreads to provide a carpet of flowers. It has gained the Royal Horticultural Society's Award of Garden Merit. It was used to colonise the concrete terraces of the football stadium (Estadio_Azteca) built in Mexico City for the 1970 World Cup.